Lately I’ve been envisioning stories set in 1840, with an interest in Egypt. When I began to survey the historical landscape I kept coming back to Egypt. In many ways the fate of that country and the life of Muhammad Ali Pasha characterize the conflict and contradictions at the heart of the decline of the Ottoman Empire. 1840 turns out to be an important year. The Empire died slowly, propped up in the end by life support from the West. By 1800 it was a shadow of its former glory. 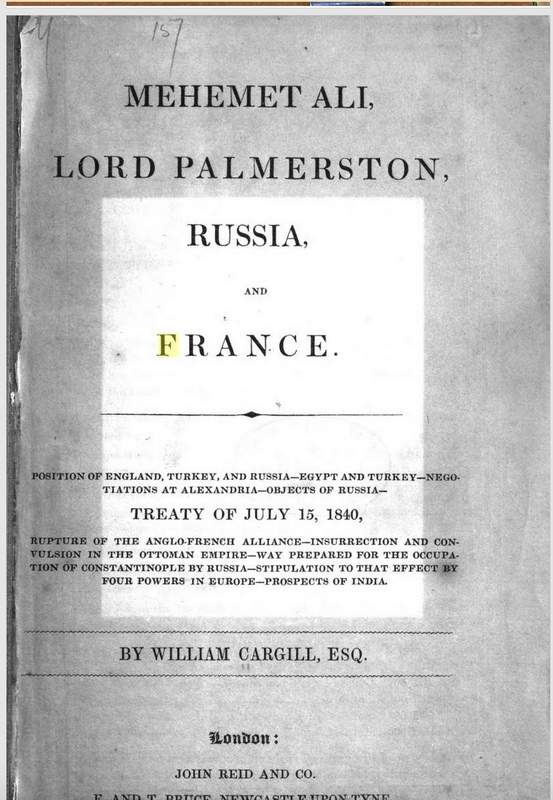 Throughout the nineteenth century Great Britain obsessed on what it called “The Eastern Question.” Britain considered it vital to their security to keep a weak and malleable Ottoman Empire as a buffer to Russian expansionist tendencies. Other Western powers alternatively cooperated and competed for influence. In 1798 Egypt was an Ottoman province ruled by Mamluks, a caste of military elite. (By way of background they had ruled Egypt since the thirteenth century. They fell to the Ottomans in 1517 but governed Egypt as vassals after that.) The empire’s military prowess had weakened and all of Europe knew it. That year, Napoleon, then in service to the French revolutionary government, proposed capturing Egypt to thereby obtain a source of income and also blocking British access to the Red Sea, and what is more to the point, to a major route to British India. The French army took Cairo in July 1798, the Mamluk ruler fled south, the Ottoman pasha fled north. A month later Nelson and the British fleet defeated the French in the Battle of the Nile. The French held on for three years in total before abandoning it. This brief episode is important for two major reasons. The first is that French (and therefore Western) influence lasted much longer. The second is the advent of Muhammad Ali, who entered Egypt as an Ottoman commander sent to drive out the French. Interestingly, Muhammad Ali (known as Mehmet Ali when young) wasn’t Egyptian. 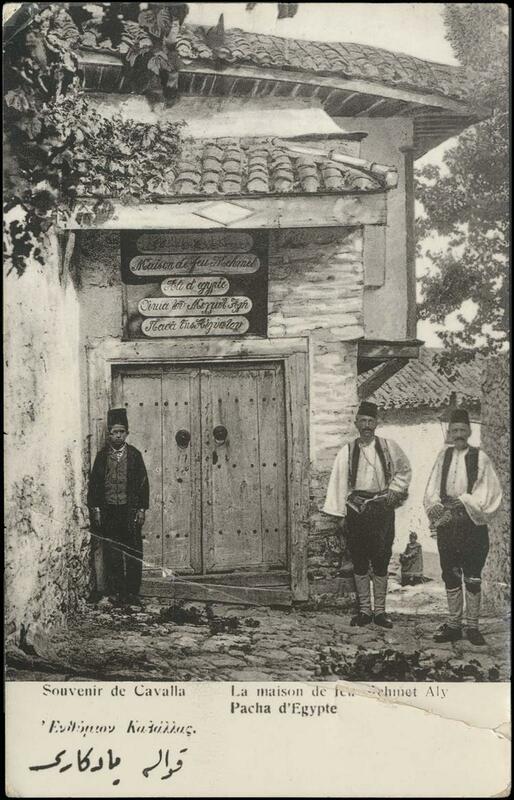 Born in Kavala in what is now Greece, but which was a multi-ethnic town within the more European sector Ottoman territory, he is believed to be of Albanian or possibly Albania-Turkmen descent. Raised by an uncle who was an Ottoman official, he became a tax collector and rose rapidly through the ranks before taking a military commission. The departure of the French from Egypt left a power vacuum and touched off full-scale civil war between the Mamluks and the Ottoman Turks. A third party consisted of Albanian mercenaries led by Ali. Ostensibly in the employ of the Ottoman sultan, the Albanians in fact switched sides back and forth and exploited ethnic and political divisions. In the chaos of the civil unrest Ali took control of the Albanian troops and ultimately the entire country. He was 34. When the dust settled Ali was in power and the Ottoman sultan acknowledged his position—he had little choice. Ali became Pasha or Ottoman governor, but he had more ambition than that. It is probable he intended Egypt as his own from the beginning. The weak and neglectful sultans did little to intervene. By persuasion, diplomacy, and, if necessary, brute force, he extended his control to the entire country. He enjoyed so much popular support, the sultan, who had reason to be wary of him, couldn’t oppose him. However, he initially focused his efforts securing his base in the country and reinforcing his independence. Muhammad set out to create a European style government. To do that he had to work from top to bottom reforming Egyptian society, creating a healthy economy, educating a professional class of bankers businessmen, and bureaucrats, and modernizing the army. He nationalized agriculture but greatly increased farm wages. He established the foundation of an industrial base. 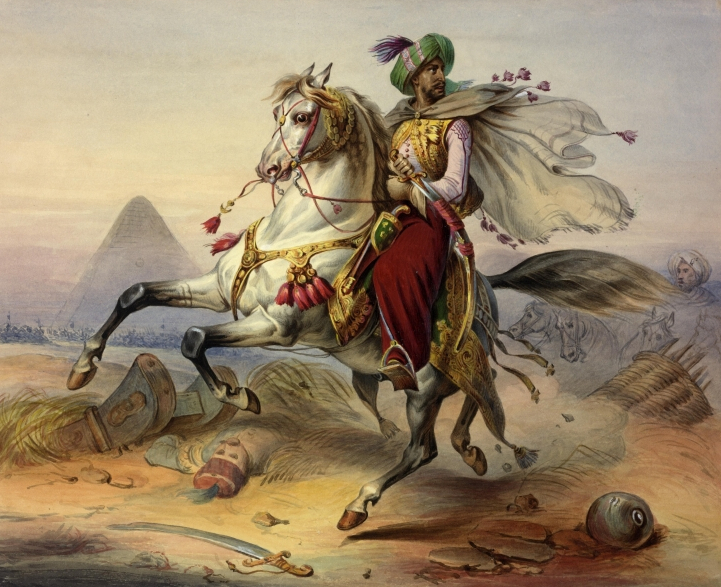 While building up his army he fought in Greece and Arabia on behalf of the sultan; the 1820s involved a series of rebellions against Ottoman rule, military expeditions, diplomatic horse-trading and shifting alliances. Muhammad lost most of his navy to a European allied fleet while doing the sultan’s bidding in 1827. In compensation, he demanded that the sultan give him Syria. . Ali had never lost sight of his main goal: to build up his own territory The sultan dithered. Ali rebuilt his fleet and in 1831 troops under the command of his son, Ibrahim, invaded Syria under the pretext of repatriating men who had fled Egypt to avoid military service. The Ottoman Army was no match for the Egyptian one. The Battle of Konya left no military obstacle between Ali and Istanbul. The sultan, however, accepted military aid from Russian, alarming Britain and France. The Western powers forced the first of a series of treaties that gave Ali some, and eventually all of Syria with his son as provincial governor, nominally under the sultan, but in fact answering to Egypt. The next several years were rife with rebellions and unrest in Syria. In 1839, on a pretext, Ottoman forces based along the Euphrates (modern Iraq) marched on Syria in a attempt to take it back. Again Ibrahim Pasha easily defeated them. 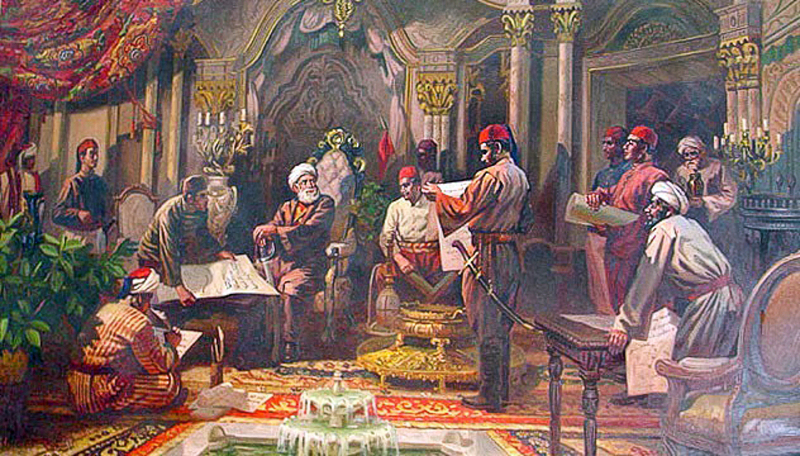 The Treaty of London in 1840 forced Ali to give up Syria, limit the size of his army, and give up his navy. In return it confirmed the hereditary right of his family to rule Egypt, a privilege no mere Ottoman viceroy would ever have had. He continued to rule for several more tumultuous years, but senility felled him and he was pushed aside by his son Ibrahim Pasha. Muhammad died in 1849, precede, alas, by Ibrahim. A grandson took his place. This regional upheaval —and the interference of Western powers in it— is at the root of many of our current power struggles and conflicts. It is also an era full of the seeds of many stories—adventure and romance. Muhammad Ali of Egypt, on Historipedia, Use dated May 2011. Such an interesting look at the 19th century Middle East! As you have shown, the Ottoman Empire was “the sick man of Europe” long before WWI brought about its end. Also as you have shown, the sins of the fathers are visited on the sons. We are still paying in poor Middle East relations for what occurred in past centuries.